Please note: A key card will be required to access the Clubhouse and it's facilities. The card is available from the Property Management office during business hours and a deposit of $50 will be required. This deposit will be refunded upon return of the card to the Property Management office. 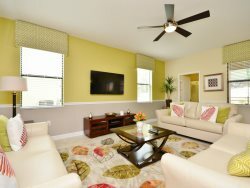 Bella Piazza is a luxury vacation style condominium complex in the Berry Town Center at the intersection of Highway 27 and Sand Mine Road. Within a 10 15 minute drive, you can be at the main gate in Walt Disney World. Publix groceries, restaurants and bars, gas stations and ATM are in walking distance, and a 24 hour Walmart is right up the street. Orlando International Airport is 30 minutes away. Bella Piazza Resort is perfectly situated adjacent from the Highlands Reserve Golf Club and a short drive from some of the most popular courses in Central Florida, including Mystic Dunes, Southern Dunes, Ridgewood Lakes, Legends, Stoneybrook West, Diamond Players Club, Orange County National, Champions Gate and Reunion. 7 miles to Walt Disney World Resort, 18 miles from SeaWorld, 23 miles from Universal Studios and 28 miles from Legoland. Shopping and restaurants are right next to the resort. Golf is 1 mile away at Highlands Reserve. The Orange County Convention Center is 20 miles and Orlando International Airport is 31 miles.